Most powerboats of somewhat ordinary size are designed and built for planing. Almost anyone can create such a boat. It will require a flat bottom surface aft. A kitchen table will do just fine. Still, making a V-shaped bottom will increase the power requirements. One is that the G-forces may be damaging to both boats and people when going fast in a chop. That is, unless the V-shape has a very deep angle in which case it will need even more engine power. The other and more serious drawback is that these hulls are generally inefficient, on the verge of unusable, when trying to go more slowly – at intermediate, sub-planing speeds. So why don’t we just increase the engine power of such a boat and it will go even faster? The problem is, with its round bilge hull shape, it is essentially a displacement type of hull. If you increase the speed, it will sink deeper and deeper in the water. 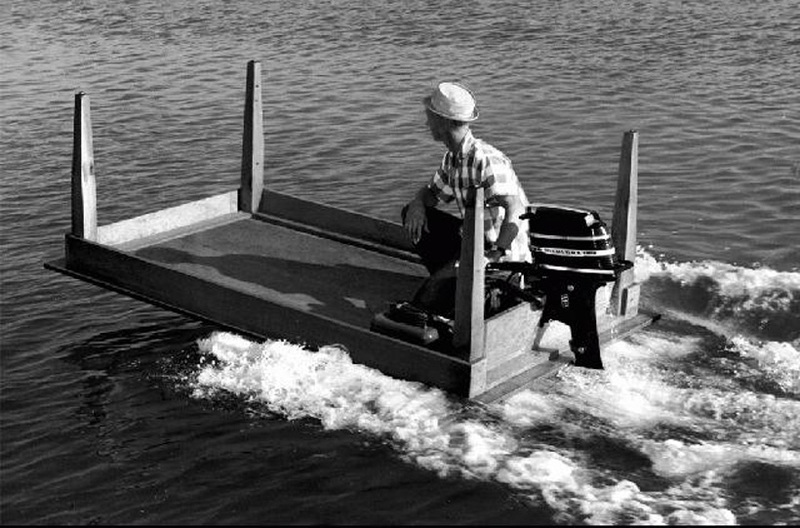 This has been tried in the 1920s by businessmen going from their summer houses on Long Island to their offices and banks on Manhattan. Trying to speed up their big, fast commuter yachts by installing bigger steam engines and turbines, at speeds around 40 knots the yachts travelled so deep in the water that there was a risk of sinking. 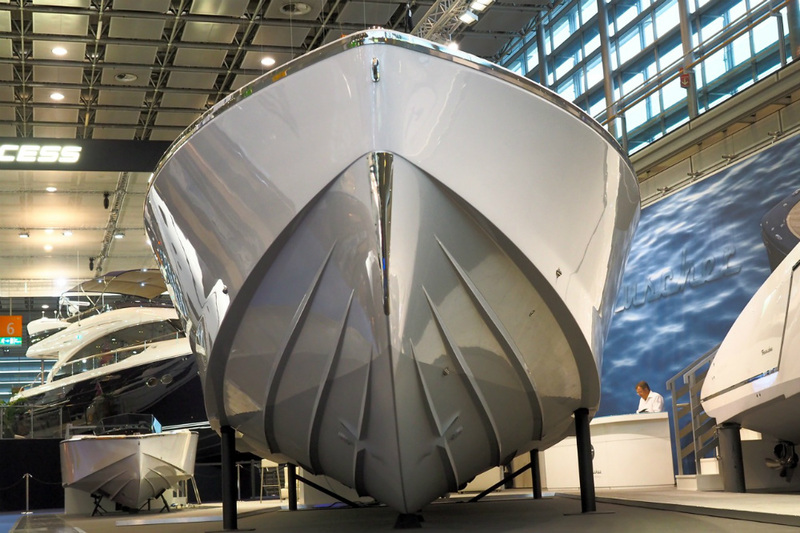 Which kind of hull shape should you go for? 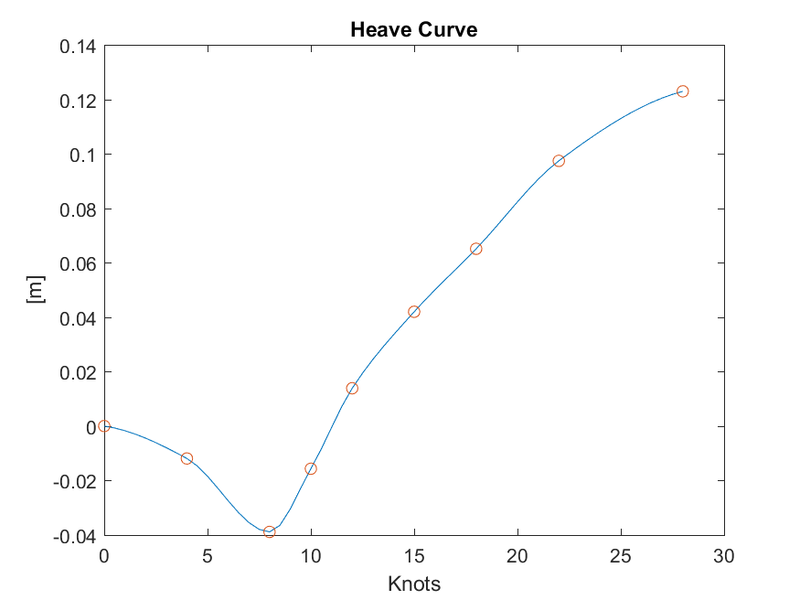 * The displacement hull can only go slow, and its speed is limited by the length of the boat. * The semi-displacement hull can go faster, but not very fast. 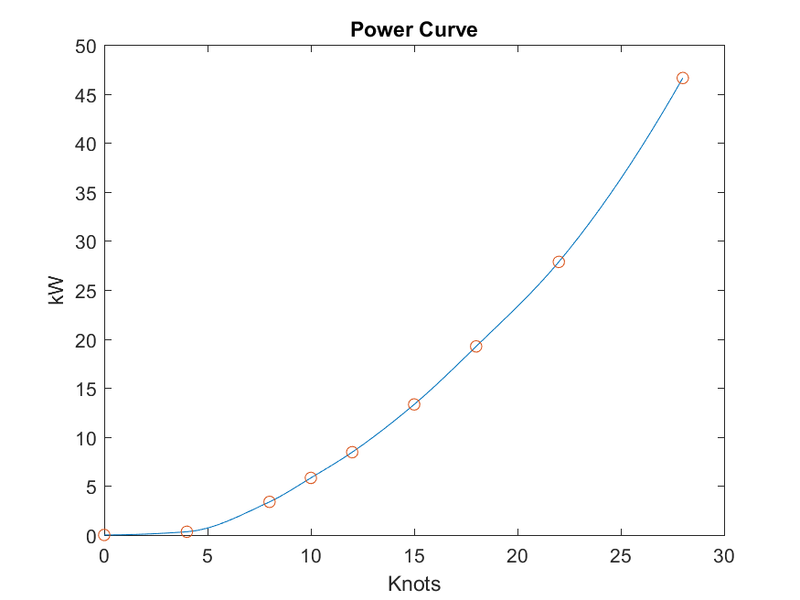 * The planing hull can, but it will struggle at intermediate speeds. But isn’t there any way to provide a bigger range of usable speeds? Making a boat able to go at all speeds – both displacement, semi-planing and planing speeds – is still a great challenge. 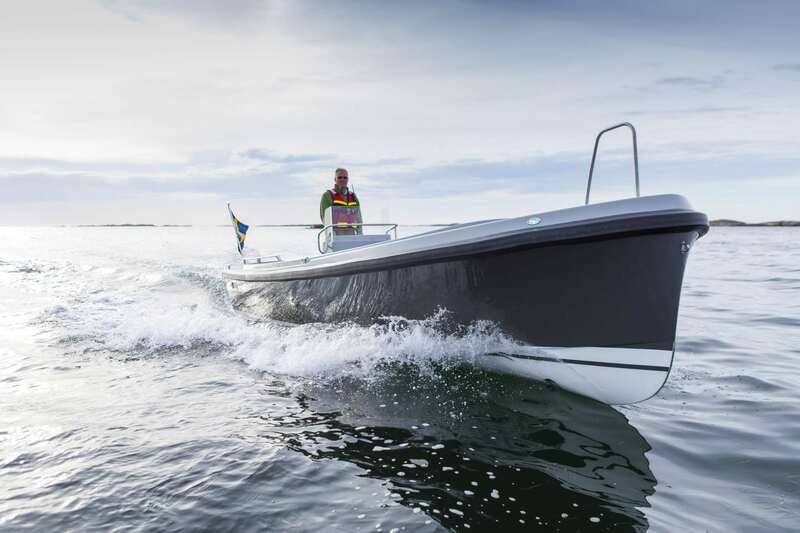 But when setting out to design a new powerboat able to behave well at all speeds, the process is delicate and the outcome is still difficult to know at the design stage. We have done this a couple of times, and to some extent I guess that we have been lucky – but you cannot rely on luck alone. In order to assess the behaviour of our designs we have chosen different routes. 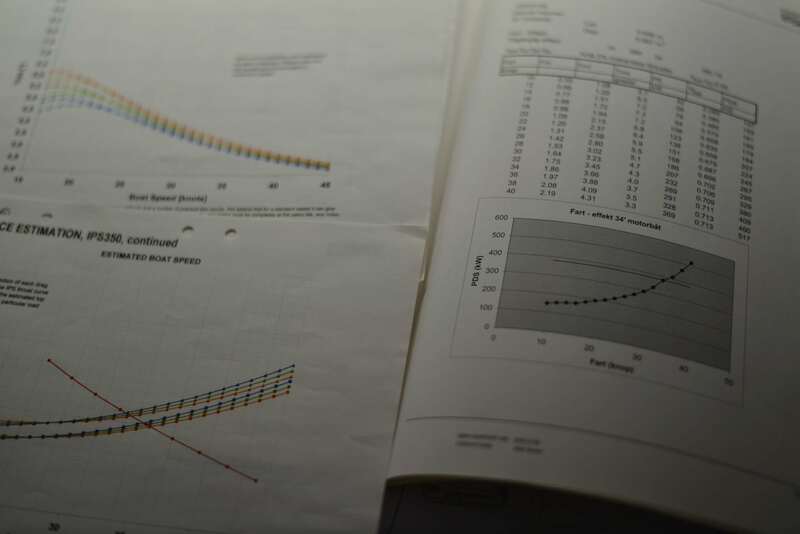 With the Celeste 37, we collaborated with specialists SSPA to analyse her performance before the build started and also with Volvo Penta for a performance estimation regarding resistance, speed, and trim in relation to power and propeller. The results helped us to finely adjust trim by tweaking the hull shape by a few centimetres in the stern area but more than anything to confirm that her basic hull shape would work fine. The Celeste 37 is designed for high planing speeds. Her hull may not be radical but is different from most powerboats in the shape of her bow, which is sharper and slightly less buoyant. There are reasons for this, of course. 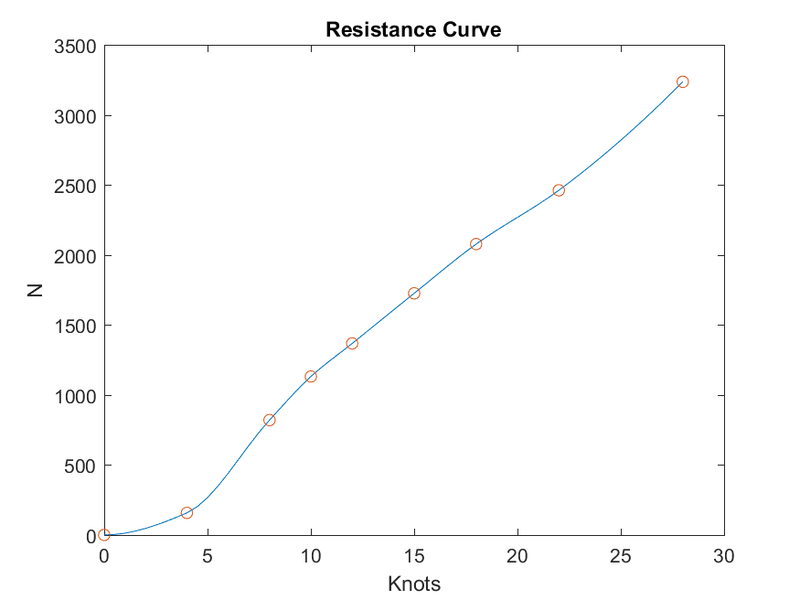 One of the intentions with this design was to avoid a ‘hump’ in her resistance curve in the difficult transition from low speed to planing speeds. She had to run fine also at intermediate speeds between 10 and 15 knots, without drawing a big wave. Her stern is also different in not having a typical transom, but a rounded stern, much like a double-ender. This rounding of the stern continues under water and was another of the reasons that we wanted an analysis before build started. With the Nautus 7-50, we wanted to take these characteristics one step further. The hull was designed to a great extent based on a somewhat intuitive idea and the end result is different from most existing both planing and semi-planing hull types. It may not be new, but it is unusual, without doubt. 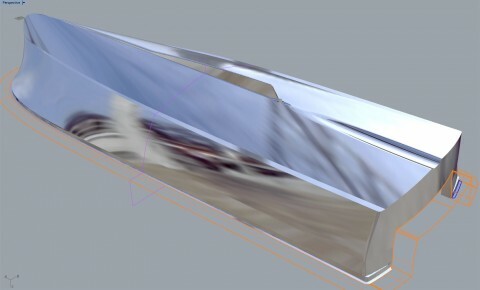 The images show the hull in early stages of the project. Analysing the hull and its parameters, it looked good. But we could not stop there because, apart from the hull shape being a little odd, the numbers, too, were unusual and we found no good references to existing hulls. This is tricky, because in this situation you will not know how the actual boat will behave in real life. In particular, we added a shallow tunnel aft to allow space for a more horizontal propeller shaft, and a small fin to improve manoeuvring and these could affect the behaviour as well. It was clear to us we had to evaluate the hull in a serious way so we made a complete CFD analysis, at different speeds. This analysis is computer heavy and very time-consuming. Testing one speed takes a full night but the computer runs by itself and the results can be viewed in the morning. 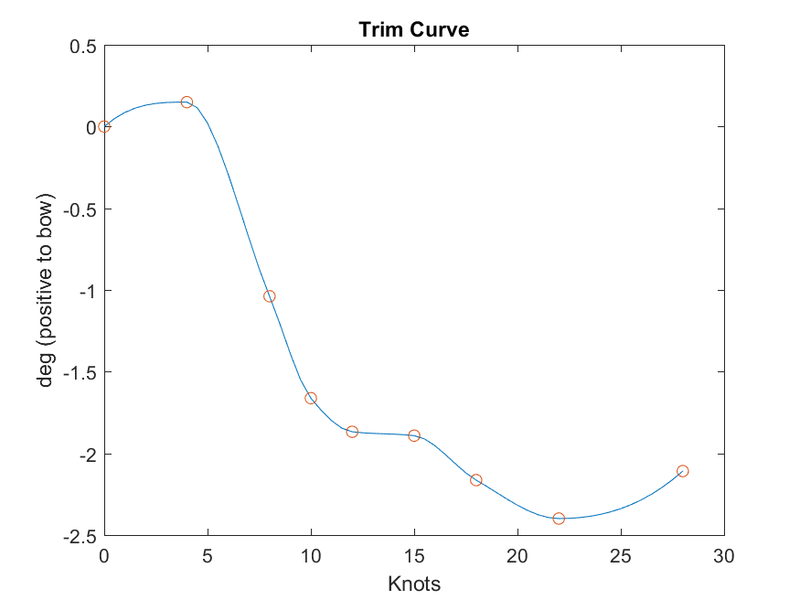 The output shows the wave pattern created by the boat, how it lifts a little out of the water, raises its bow (called trim), the pressures along slices of the underwater body and the resistance in the same areas. The results looked fine so far and we felt more confident that the real boat would work well. Still, with some reservation regarding effects of the propeller tunnel and fin, and a few other aspects. A year later the first boat was finished and tested, and all involved have been overwhelmed by how well she runs at all speeds, how easily driven it is, with a power consumption of approx 0,40 – 0,45 litres per nautical mile, more or less regardless of speed – always silent and smooth, without any slamming in head seas even at high speeds. She does indeed seem to be one of the relatively few crossover boats, good at any speed. What is perhaps more important is that she shows this kind of civilised behaviour while offering much lower emissions, less noise and less wake. This is further underlined by the fact that she has the most modern type of common-rail engine – a type of engine which is much more power efficient also at lower speeds than previous generations.